When we walk with the Rando Chiens in the summer we sometimes go up from the villages below Les Combes and Gav's often said it'd be great to ski down IF we ever had a winter when there was enough snow. But it'd mean using two cars, parking at one of the villages like Puy St Andre. 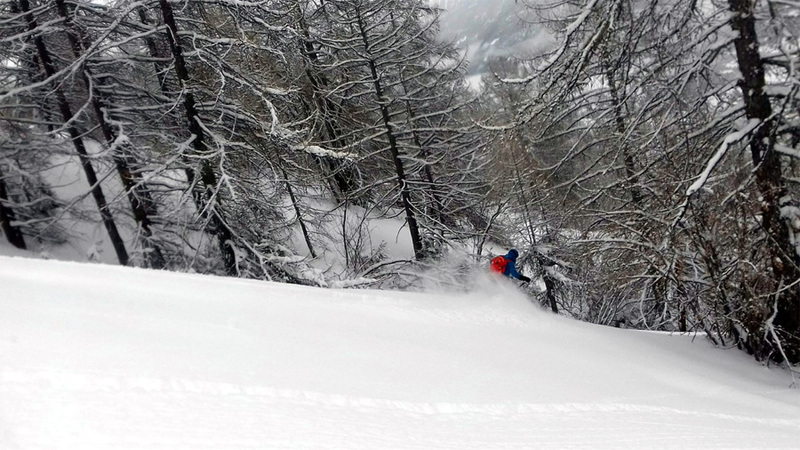 Yesterday Gav had a Plan B not to ski all the way to Puy St Andre but with the sidecountry in resort chopped up thanks to the half term hordes his idea was to ski down from the Rocher Blanc chair off the chemin and through the trees taking skins so we could hike back up before we got too low. It was a good plan except that it was snowing all morning and we were shrouded in cloud as we arrived at the chemin. 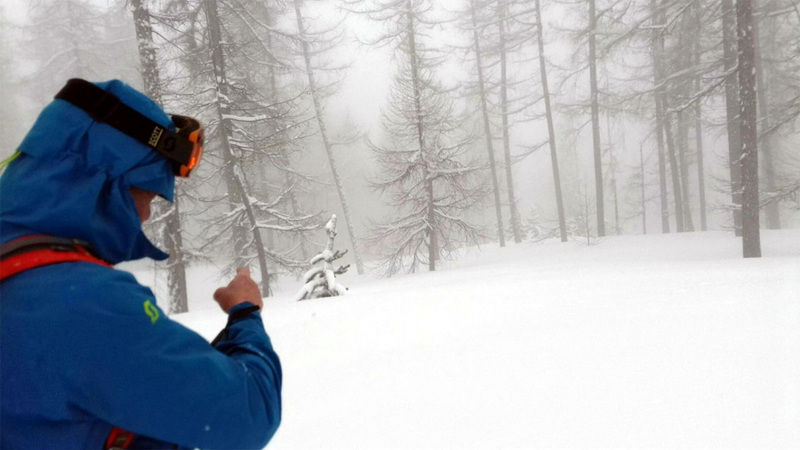 But we dropped in anyway as the trees were around 100m - or a dozen powder turns away - where the vis was a tad better. 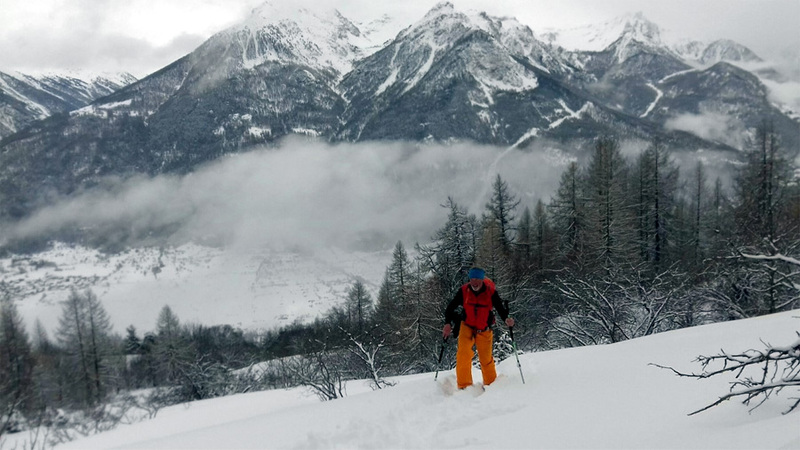 As we skied down and down through the trees and knee high powder I did question whether it was time to skin back up but Gav assured me that we'd only gone around 300m so it would take just an hour to climb to the chemin. And off he went in a flurry of powder. Finally we transitioned and then had to carry the skis up some steep banks and rocks that we'd skied / side-slipped down. Gav was in front, naturally, making tracks (main image) and soon the air was as blue as the sudden break in the clouds that had revealed the sun. The snow was getting heavy and he was on his super wide 114mm K2 Coombacks so he was finding the going tough. Now it takes a lot for Gav to throw in the towel but when he turned to me and declared, 'I don't think I can do this' I knew we were in trouble. At least as far as hiking up was concerned. Fortunately there was the alternative. To ski all the way down to Puy St Andre. Although the snow was somewhat heavy for smooth skiing we made it down to the road and then skied down as far as we could. Just as we'd taken the skis off a car came by and generously stopped to give us a lift to Briancon.